Pop quiz time. 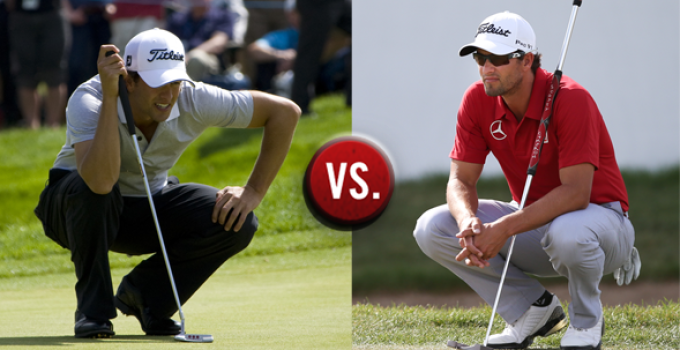 Who’s the better putter, 2013 Adam Scott or 2015 Adam Scott? Keep in mind, three years ago Scott was wielding a long putter and anchoring it to perfection, brushing putts in around Augusta National on the way to capturing his first green jacket. Fast forward to today and he’s being force by the USGA to keep the broomstick in the closet, having to use a short putter that was the instrument to his “limited” success. (We say limited because he was still pretty dang great using a standard putter). Cleary Scott was a better putter back in 2013? I mean, he won The Masters, and you have to be a good putter to win there! Well … in a shocking upset, 2015 Scott is the winner. So, what do you think? Was last week a foretaste of things to come for Scott this year? Or was his performance on the greens a blip in the radar? Message us @BillyCasperGolf on Facebook and Twitter.